in February 2015, the city council authorized giving the building at 401 Main St. S.E. to a small charity, Good Samaritan Ministries, for a token $111 after the group said it would make an estimated $157,000 worth of repairs over five years. At the time the council spurned another offer, by an investor who wanted to buy the property for $16,500 and said he would renovate the building for more than $240,000 so it could be rented for weddings and events. The charity deal never got off the ground. This past March I talked with Alex Contreras, a native of Costa Rica who runs the Universal Coffee shop in the Carriage House Plaza, across Santiam Road. 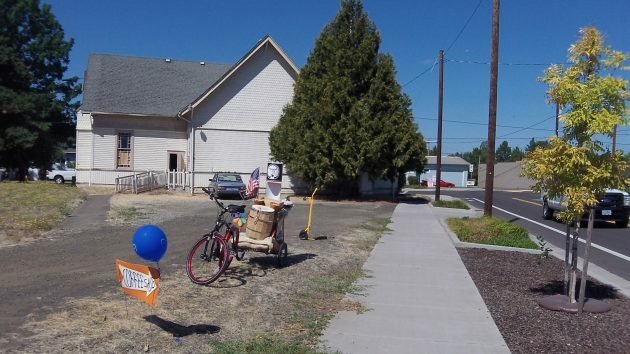 He and his wife rented the former church for storage. His vision was to turn the building into kind of a cultural center, using coffee, music and art to provide a bridge between Latinos and the rest of the community. The city bought the property for $150,000 in 2000, using street bond funds, thinking it would be needed for rebuilding Main Street. But the street plans changed and the property became surplus. A side view of the historic structure at Main Street and Santiam Road. 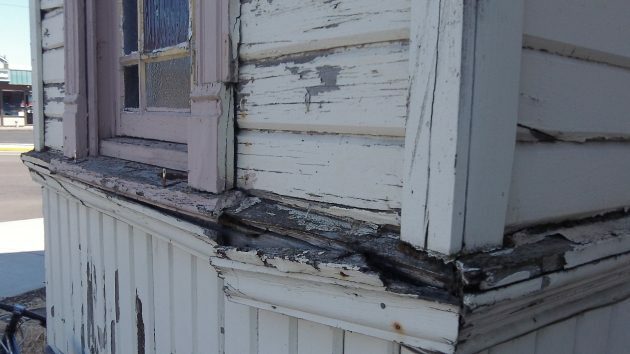 Just because a building is old doesn’t mean it’s worth spending a ton of money restoring it. Tear it down, for goodness’ sake, and use the property for something else. Given the choice between pavement and a moldering relic, I wouldn’t choose pavement. The folks bringing you this plan are the same leaders who banned recreational pot sales even as a majority of Albany voters voted aye on Measure 91. Now, they sheepishly bow their heads as they see tax revenues fleeing to Benton County and small businesses burgeoning in Corvallis while Albany twiddlles it’s thumbs and “saves” another sagging structure. The City Council and the Mayor obsessively fetishize aging buildings. Rome burns but their violin plays on. The council is right to plow a couple hundred grand into this old building. They paid to build a merry-go-round. Why not further blurring of the line between church and state. Once the Trumpster gets to Pennsylvania Avenue, the local pols will have their hands full just trying to keep the lights on. Rebuild that old building now. We’ll need it to house the newly homeless when the Trump Economic Plan destroys the nation. That’s …oh so…right. The GOP had better remove tRump very soon. Tomorrow if not sooner. Otherwise our already interesting times could turn ugly. GOP…your move. Tony, you cold not be more wrong. They don’t make buildings like this anymore, and not restoring this treasure would not only deprive our heritage, it would rob every generation to come after us of theirs. They CAN’T make buildings like this for a reason. Building Codes! This is a derelict building and not economically feasible to bring to modern standards. Your “heritage” depends on a dump? Only CARA would put money into this rat hole. Since it’s NOT downtown, the mayor/council won’t let this happen unless one of their “friends” own it. Hah, excellent point. Really, there are plenty of beautiful historic churches all over Albany that have actually been taken care of and not abandoned. Clearly nobody needs this one. Tear it down to improve visibility for Northbound traffic on Main St. Improve Main St. from Pacific.